This "T" shaped cushion combines the benefits of hollow-fibre in the side and back panels to provide comfort and gentle support. It also has a convoluted foam base cushion for longevity. 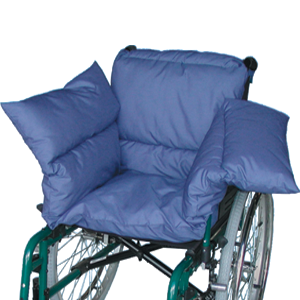 The fire retardant navy polyester outer cover is durable and unobtrusive, allowing this pillow to be used in either an armchair or a wheelchair.